Some months ago, we were having dinner at a friend’s house. At some point I made use of the facilities. Little did I know that I would fall in love. Our host admitted that it was indeed brand new. He’d just gotten it at Ikea that day. Ikea? I thought it must have come from some high-end bath boutique where the toothbrush holders cost a day’s salary. But if it was from Ikea, it was probably reasonably priced. But we’ve been on belt-tightening mode for several months now, not purchasing anything but food and the basics in order to pay the mortgage and property taxes (you know, so we can remain in our beloved home). So I didn’t really consider buying a new bath mat, especially since we don’t even need one. 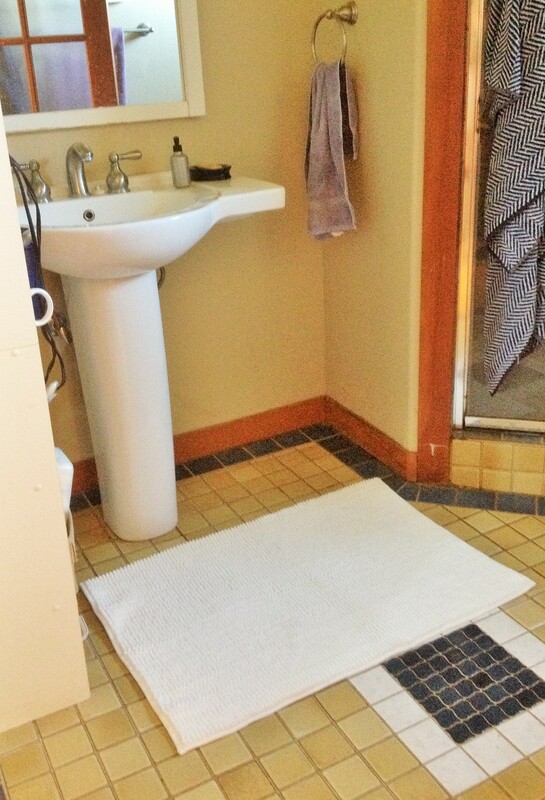 Both our bathrooms have somewhat worn but perfectly serviceable rugs in place. A few months later, Dave had to replace something–I don’t remember what–and he casually asked me if we needed anything from Ikea. The memory of that soft, pebbly fabric washed over me. First I resisted. Then I broke. My unfinished sentence hung in the air like a pitiful wish. Despite the lack of its necessity, Dave brought one home. I was beaming when he handed it to me. It was kind of ridiculous how much I loved it. 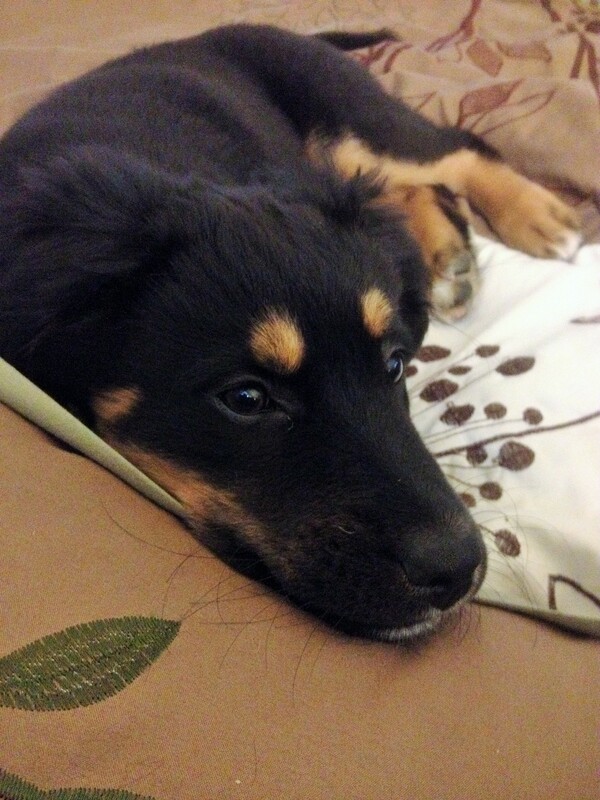 I love, love, love Ruby. But she has fur to spare. The next question was where to place it–upstairs where I would get to enjoy its softness on my bare feet every morning and night? Or downstairs where guests could appreciate that luxury under their shoes? Downstairs is also the bathroom where Dave washes our dog Ruby every morning when they return from Point Isabel (where Ruby inevitably goes swimming and rolls around in sand and mud). I started to feel a bit possessive, almost protective of the bath mat. If I put it on the ground, it would get dirty. With people tromping all over it, it would lose its cottony cushy goodness. I decided to hang it on a towel rack until I could find it a good home. Since then, we decided to rent out a room in our house to help pay the bills. So we moved the office out of the downstairs bedroom into the nook of the master bedroom upstairs, which previously housed all my books, yearbooks, photo albums, and boxes of photos that I’d always planned to put into albums. And of course the downstairs bedroom, though small, is quite a bit larger than the nook where the office was being relocated. Bottom line? We had way more stuff than room to put it in. Our bedroom became stacks of books, boxes, files, and an excess of office furniture. We also had to relinquish use of the closet in the downstairs room in order to rent it out. (Tenants don’t usually like landlords barging into their room to access shipping boxes or out-of-season shirts.) So more stuff had to find a home. And the shed in the back yard is already full of Whereabouts Press inventory since we stopped paying for off-site storage. Basically, we were living like hoarders, clearing paths in order to travel from our bed to the bathroom. This was not the sort of place that deserved a beautiful new bath mat. 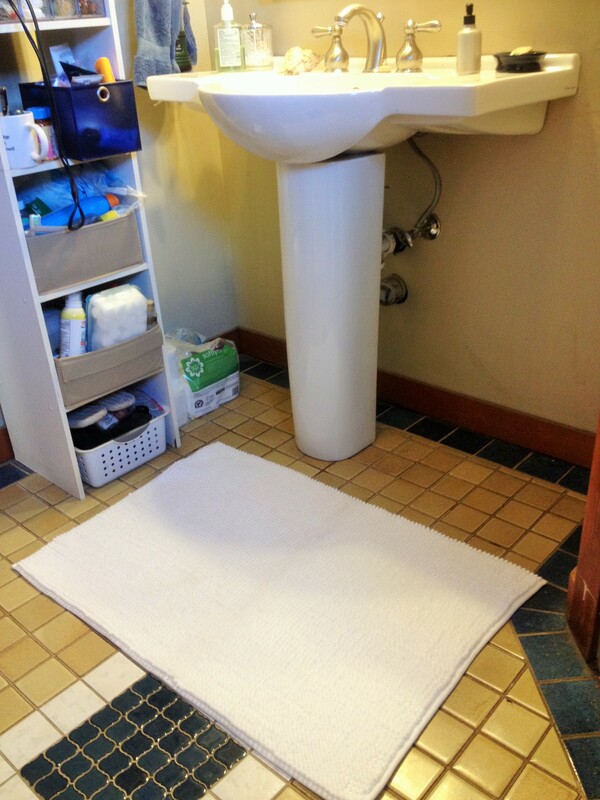 And since we’d let our housekeeper go last year, the bathroom is cleaned somewhat irregularly. It would look ridiculous to put down a new, white rug when dog hair was just going to find it anyway. 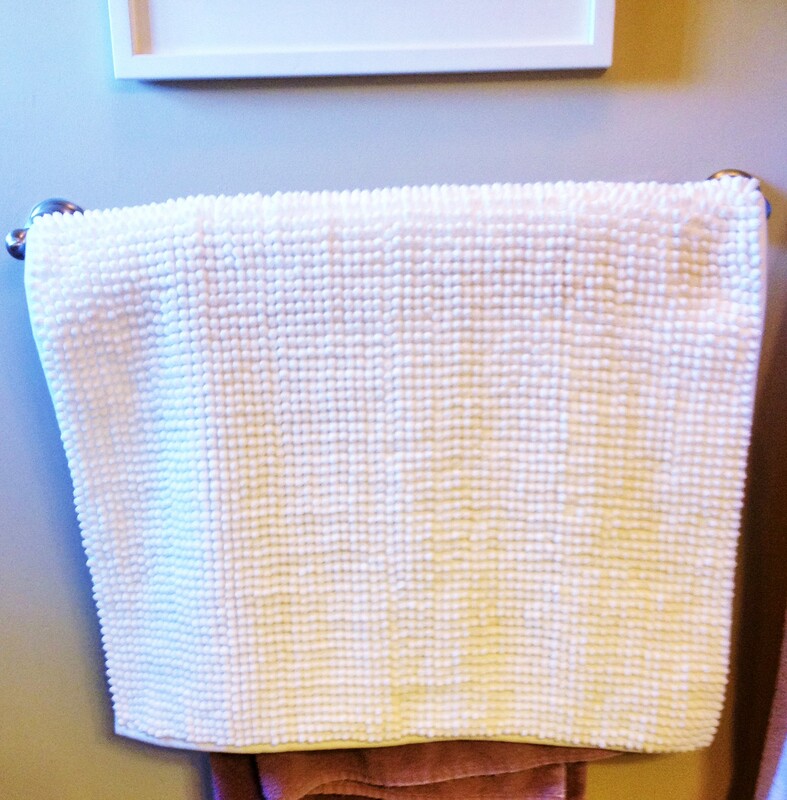 So the bath mat remained clean and perfect on the towel rack. For weeks, most of our available energy was going toward making the downstairs room attractive and livable for a tenant–painting, cleaning, etc. In any case, our home is starting to look once again like a home. So I thought it was time. Our house is not perfect, and neither are we; but we deserved to feel that soft, fluffy bath mat beneath our toes. Because life is too short. And besides, it’s only a bath mat.